Coral reefs around the world are in serious trouble from pollution, over-fishing, climate change and more. The last thing they need is an infection. But that’s exactly what yellow band disease (YBD) is—a bacterial infection that sickens coral colonies. Researchers at the Woods Hole Oceanographic Institution (WHOI) and colleagues have found that YBD seems to be getting worse with global warming and announced that they’ve identified the bacteria responsible for the disease. Just as a doctor can diagnose a child with chicken pox by the small, round bumps on her skin, you can tell a coral with yellow band disease (YBD) by its own characteristic markings. 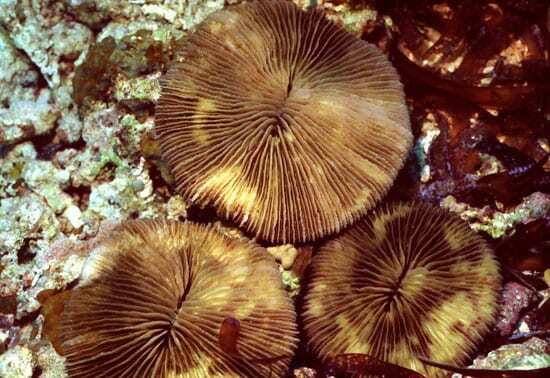 This affliction etches a swath of pale-yellow or white lesions along the surface of an infected coral colony. 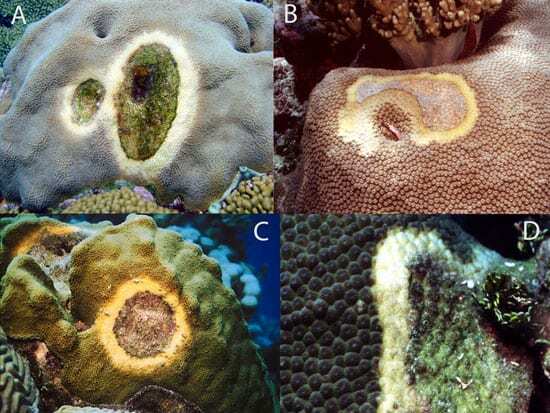 The discolored band is a mark of death, indicating where the bacterial infection has killed the coral’s photosynthetic symbionts, called zooxanthellae. The coral host suffers from cellular damage and starves without its major energy source, and usually does not recover. In a paper published in the November 2008 issue of the Journal of Applied Microbiology (JAM), lead author James Cervino, a guest investigator in the WHOI Marine Chemistry and Geochemistry department, and his colleagues report isolating the bacteria that cause YBD: a group of four new Vibrio species, which combine with existing Vibrio on the coral to attack the zooxanthellae. This is the first demonstration that the same bacterial culprits are to blame for the disease throughout the Caribbean as well as half way around the world in Indonesia. The Vibrio bacteria that cause YBD are part of a family with a reputation for disease. “What we have are coral pathogens that are genetically close to shellfish pathogens,” Cervino says. For example, one of the Vibrio bacteria found in corals also causes infections in prawns, shrimp, and crabs. The bacteria are also distantly related to Vibrio cholera, the pathogen that causes human cholera epidemics. There is no known danger to humans from YBD, however. Cervino and colleagues grew Vibrio pathogens together with healthy coral. They found that YBD infection occurs at normal ocean temperatures, but that warmer temperatures made the disease even more virulent. Cervino explains, “Contrary to what many experts have assumed, this disease occurs independently of warming temperatures.” However, when the temperatures go up and the corals are already infected, the infection becomes more lethal. “Thermal stress and pathogenic stress are a double-whammy for the organism,” emphasizes Cervino. With the Vibrio core group occurring in tropical oceans all over the world and water temperatures on the rise, he says, the prognosis for corals and the spread of YBD is rather grim.